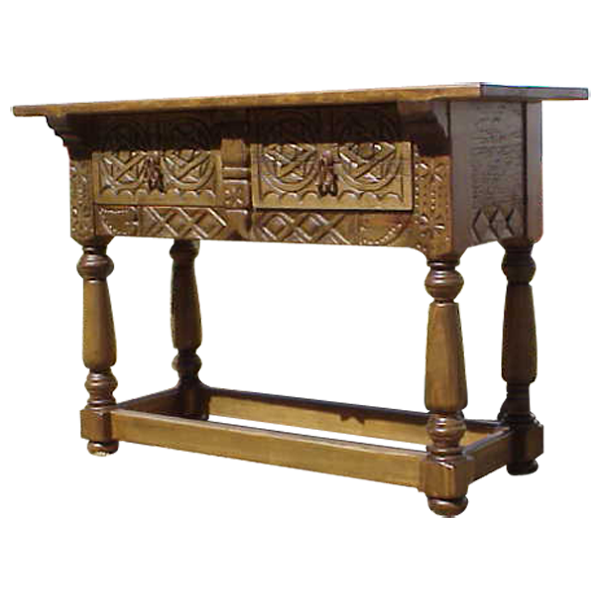 This handcrafted, Western style console is representative of the high quality, hand carved details that embellish our custom furniture. The console features twin drawers, and each drawer is hand carved with exquisite, geometric and floral details. Matching geometric and floral designs adorn the front of the console. Each drawer has a hand forged, iron handle in its center. The console has an open, wide top with a classic, straight, top rim. Each lateral side of the console has a rectangular panel, and the lower part of the panel has ornate, geometric designs. The console is supported by beautiful, hand turned legs, and the legs are joined by solid wood crossbars. It is made with the best, sustainable, solid wood available, and it is 100% customizable.